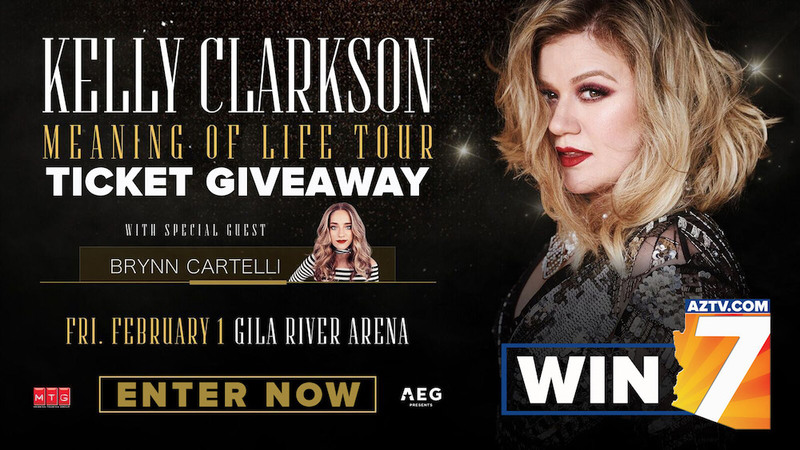 From now until January 30, 2019 enter daily for your chance to win a pair of tickets to the Kelly Clarkson’s Meaning of Life Tour stop in Glendale, Arizona on Friday, February 1, 2019 at 7pm! • Enter each day during the Sweepstakes window (January 17th – 30th, 2019) to increase your chances to win. 1x pair of tickets to the Kelly Clarkson’s Meaning of Life Tour stop in Glendale, Arizona on Friday, February 1st, 2019 at 7p. Starting January 17th, 2019 at 8a, enter online until January 30th, 2019 at 11:59p at aztv.com/win for your chance to win. All winners (3 total) will be randomly selected by KAZT contest software. Winner must claim their prize by 4:00pm on Thursday, January 31, 2019 and must present photo identification.